To Jung, the archetypes emerged from a lower unconscious realm universally subtending the psyche: "I have, therefore, even hazarded the postulate that the phenomenon of archetypal configurations - which are psychic events par excellence - may be founded upon a psychoid base, that is, upon an only partially psychic and possibly altogether different form of being. For lack of empirical data I have neither knowledge nor understanding, of such forms of being, which are commonly called spiritual. From the point of view of science, it is immaterial what I may believe on that score, and I must accept my ignorance. But in so far as the archetypes act upon me, they are real and actual to me, even though I do not know what their real nature is" (Jung 1963 384). Einstein and Jung met for a series of dinners in Zurich while Einstein was refining his special theory of relativity. And, said Jung, " Professor Einstein was my guest on several occasions at dinner... These were very early days when Einstein was developing his first theory of relativity, [and] it was he who first started me off thinking about a possible relativity of time as well as space, and their psychic conditionality. More than thirty years later, this stimulus led to my relation with the physicist Professor W. Pauli and to my thesis of psychic synchronicity." When synchronicity occurs, what can we do but stand in the Mystery? When we stand in the mystery of creation and look up at the skies or over the waters, we sense that our knowledge is but a pale reflection. Yet, as a unique reflection of cosmos, of all that is, we already have all we seek, already are more than we can imagine. The darkness of unknowing is a plenum of information. When we fully embrace the world each and every given moment, the unknown comes and stands beside us. Lightning illuminates our path. The way to keep a path alive is to walk on it. When we empty ourselves of the contents of our consciousness, we find the mystery of our own incarnation, alive in awe and wonder, in the sacred waters of dreaming, without unnecessary mystification, tolerating ambiguity and the Unknown. We enter a wildness without maps which opens a wildness within - of our passions and creativity, and in our primal and loving relations with others. Abstract: Things often fall apart, but sometimes they fall together in the probability field. Such transformative points can be life-changing quantum leaps in self-awareness. The issue is one of 'similar things' that seemingly stop the arrow of time dead in its tracks, immersing us in the extraordinary, the mysterious. Thus, synchronicity is essentially direct insight into the hidden confluence of psyche and matter. It shocks us into broadening our view of the world and the fabric of reality. Synchronicity is the core of the world and human existence. It is a unique expression of the metaphor-forming process. Repeated engagement with the spectrum of unconscious imagery impacts us resonantly on all levels by molding us with experience, emotion and memory. The synchronistic totality of all conscious and unconscious self-organizing processes has its own holistic psychic structure. Psyche and substance are two aspects of more fundamental energy, which forms a universal substrate. The artificial delineation between mind and matter blurs in both the scientific and psychological models. The operation of non-locality (Stapp, 2009) is assumed if there is excess correlation of events between two spatial loci without the involvement of a classic mediating factor such as a propagating force or field (Dotta et al., 2009; Persinger et al., 2008a, b). Excess correlation, or entanglement (Arnesen et al., 2001), may be directly involved with quantum information processing or representation. Information storage and retrieval through the manipulation of differences in quantum phase of two levels of the superposition (Aczel, 2002) that define entanglement has been reported (Ahn et al.,2000). (M. A. Persinger) Is synchronicity a special case form of entanglement? Cosmology is the study of the cosmos in many contexts at many levels of observation. All cosmologies attempt to understand the implicit order within the whole of being. In this way, most spiritual and philosophical systems have a cosmology. Physically, the technical term cosmos refers to a particular space-time continuum within the (postulated) multiverse. "God" and "Nature" may be interchangeable terms, in this sense. Faith in the "gods" or archetypes of the past was predicated on things people say, on models of being and becoming. We think there are things we "know" and things we "believe", but they are based on language, numbers, and our conceptual capacity, which may or may not reflect things as they actually "are". Dr. David Rail (2011) suggests a theory based on expression of the unity between perception, self-organizing language, and the progressive self-organization of image schemata where meaning emerges through gestalt metaphor. "Metaphor involves double scope blending where structures emerge from the interaction between incongruent conceptual frames. That process is recursive leading to creative structures. ...we conceive metaphor in its rhetorical structural form, as coordination of the master tropes, or a tropology...[which] functions recursively throughout the forebrain." Rail suggests recursive tropology functions in a gestalt manner and that perception is a self-similar tropological process. Gestalt principles and the master tropes are homologous and help determine the structure of perception. He indicates how semantic sentential structures are generated from self-organization of the tropology, incorporating spatiotemporal scaling (fractal time) and metalinguistic development. Paradox arises from less than ideal syntax, which remains elusive. Nevertheless, we continue to conduct scientific inquiries into the nature and origins of life, mind, physical laws and mathematics and their possible connections to a scientifically approachable transcendental ground of existence. Our current limit of observability is subatomic particles simultaneously arising from and returning to ground (implicate order), creating an interference pattern or vortex, mirroring circular or spiral processes, global patterns that stretch across the mental and physical worlds. Spin is the original self-referential process. Hu and Wu (2010) suggest spin is the linchpin between the mind and brain, that is, spin embodies transcendent/immanent consciousness. Things we think or experience -- physically and energetically, including who are we, where we come from, and where we are we going -- necessarily remain open to revised interpretations in terms and meaning. Paradox and symmetry arise from the dynamic principle of retrocity or recursion inherent in the natural number sequence, a mythic variant of 'eternal return', and self-referential systems. Jung expressed and amplified such concepts as the 'tension of opposites', conversion experiences (enantiodromia), transcendent function (transformation), the mandala (holism), and unus mundus, an alchemical notion of nondual experiential wholeness. In Bohm's view the engineering of the implicate order we call the brain is an important, but not primary reality. Bohm's model can account both for what might be called simultaneity and alterity. Time (alterity) is an imaginary if useful construct, like the square root of negative one -- a perceived property of what he calls the explicate order. The explicate is expressed from the whole (implicate order), a sea of infinite potentiality where everything happens at once (simultaneity). What is this invisible ground whose image we carry in our souls where spiritual ideals merge with worldly realities? Isn’t it always right here, right now everywhere always forever? The contextual background, the invisible environment, is the fundamental ground from which both mind and matter emerge, the luminous absolute space of reality which transcends the mere absence of energy/matter. Meister Eckhart claimed, "There is no such thing as a spiritual journey. If there were a spiritual journey, it would be only a quarter inch long, though many miles deep. You do not have to go away outside yourself to come into real conversation with your soul and with the mysteries of the spiritual world. The eternal is at home --within you." The alchemists agreed and postulated that each microcosm in the universe is synergetically responsive to and resonant with the macrocosm. Microcosms constitute relatively autonomous and independent "sub-totalities". The microcosm of the little world of humans recapitulates or mirrors the greater world of the cosmos, much like quantum cosmology reflects the subquantal and cosmic realms. The distinction between the macrocosm and microcosm highlights the gap between the limited perception of the world revealed to individual immediate perceptual and cultural consensus, and the greater world that always escapes it. The macrocosm is the universe that transcends our particular experiences, giving us an enlarged view beyond our short lives and perceptual limitations. Experience of the macrocosm, as in synchronicity, can act as a corrective to our basic myopia. Knowledge of the macrocosm draws us into a wider world. We feel awe before the grandeur of nature, the sweep of human history, and the growth of science. We embody the potential to integrate the great and the little into a life that appreciates both scales. In integral philosophy, kosmos refers to all of manifest existence, including various realms of consciousness. The term kosmos distinguishes a nondual Universe (both noetic and physical aspects) from the strictly physical Universe that concerns the traditional sciences (Wilber). It is also the assumed basis of Jung's concept of synchronicity with the fundamental role of consciousness. Perhaps the primacy of consciousness is revealed by current research in neurology and neurotheology which shows higher states of consciousness reached in mediation correlate with suppression of activity or chatter originating in more primitive areas of the brain (Carhart-Harris). Our sense of identity, according to many varieties of eastern religions, is mostly a function of our identification with certain aspects of self, from moment to moment. Such aspects are indistinguishable from Jung's archetypal dynamics -- virtual empty forms that structure psychic life. Virtual conception pre-exists concrete manifestation. To Jung, these primordial dynamic patterns are far more than recognizable characters, but symbolic keys to truths about the human condition and the path of personal transformation. A symbol is something which can have many meanings at once. We apprehend them intuitively. They can reveal the workings of the world and how it affects the human psyche. Thus, archetypes are the "x factor" of the human equation, carrying meanings for the human mind to decipher and utilize. Scientists have a span of beliefs ranging from the materialist to the transcendent, which determines their attitude to consciousness. At the current level of scientific understanding, consciousness is approached as holographic correlates with certain bioelectronic patterns of electromagnetic activity in the brain, rather than mere biochemical reactions converting sugars into energy. Some suggest that consciousness is a primordial property of the information domain, zero point, or unified field (Laszlo). In the enfolded (implicate order), space and time are no longer the dominant factors determining the relationships of dependence or independence of different elements. Rather, an entirely different sort of basic connection of elements is possible. Our ordinary notions of space and time, along with those of separately existent material particles, are abstracted as forms derived from the deeper order. These ordinary notions in fact appear in what is called the "explicate" or "unfolded" order, which is a special and distinguished form contained within the general totality of all the implicate orders (Bohm 1980, p. xv). Every moment is alive with the potential to fully realize that we are virtually infinite luminous beings, fully conscious of ourselves, others and our astounding place in the cosmos. But with synchronicities, the universe shocks us into another level of realization of our psychophysical connection to the universal field, to the cosmological metastructure. Psyche is microcosm; cosmos is macrocosm. Such events are usually more personally than publically significant. While it is a coherent whole, the universe is pervaded with inherent patterns of meaning at all scales, at all levels of observation. We cannot classify the parts without remembering the whole, for we are the key to the code -- the point of connection where we are part of nature and it is part of us. Unspoken secrets are revealed in that unique connection -- the experiential realization that the entire cosmos is within us. We recognize our humanity in cosmic principles, being made in their image. We are spiritual and material beings. Our DNA is our metaphorical umbilicus to the cosmos. It is a source of biophoton emission (Popp). Behaving like a liquid crystal, DNA is a transducer and self-similar, fractal quantum antenna picking up information from the zero point field or vacuum substructure. Gariaev calls DNA a "self-calibrating antenna working by phase conjugate adaptive resonance capable of both receiving and transmitting quantum holographic information stored in the form of diffraction patterns" (quantum holograms). A fractal is a pattern that repeats itself on more than one scale, like a square full of squares -- or a cloud, coastline or mountain which may be small or large, but has more or less the same shape at any size. DNA is a 6-foot long coiled "ladder" of base pair steps that coils into bigger coils. 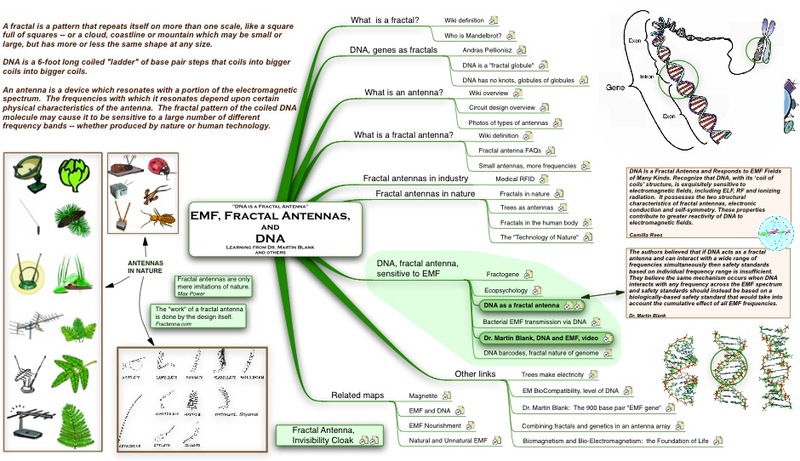 An antenna resonates with a portion of the electromagnetic spectrum. Resonant frequency reception depends upon certain physical characteristics of the antenna. The fractal pattern of the coiled DNA molecule may cause it to be sensitive to a large number of different frequency bands -- both produced by nature and human technology. We can only speculate what may go on in the imaginal (virtual replica) cells. So, the body is constantly generating these universal scalar waves, when two electromagnetic waves of the same frequency are exactly out of phase (opposite to each other) and the amplitudes subtract and cancel or destroy each other. The result is not exactly an annihilation of magnetic fields but a transformation of energy back into a scalar wave. This scalar field has reverted back to a vacuum state of potentiality. For clarification, Tom Bearden, an expert on scalar antennas, points to the well-known low efficiency of cloning. He thinks his colleague, John Bedini has discovered hidden variables in DNA antennas that have been ignored. They think researchers are adding signals which externally appear to be "pure signals", but which internally contain a great deal of "infolded inner EM noise" with respect to the local inner EM environment of the targeted cells. The scalar interferometry between the input signals "environmental inner electrodynamics" and the receiving cell's "environmental inner electrodynamics" generates overt EM jamming signals that jam, distort, and alter the intended epigenetic reprogramming. Each point in space, within and without us, is a quantum harmonic oscillator resonating with the zero point information of the groundstate or information field. Each subatomic particle is a holofractal. Each quantum coherent wave function functions as a unified whole. DNA filters and projects that in-form-ation via coherent light and sound into our psychophysical selves and world. Non-physical energetic aspects are transduced into physical experience. Conversely, non-physical mind can access non-physical information field. New physics strongly suggests that we are all holistically connected in the shared subspace domain. The biological basis for this field can be found in cellular communication. Characterizing DNA as a “nanotechnology-antenna”, Manzelli insists it is important to consider the "DNA /RNA dynamic system as an information energy catalyst, able to transmit and receive biophysical quantum signals ( e.g. Bio-Photons and associated Bio-Phonons), to and from the proteins in living cells." 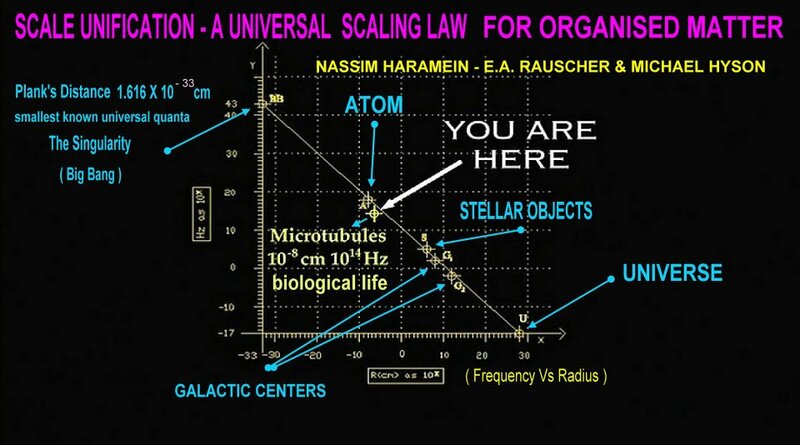 The doorway to the quantum level exists in the extracellular fluid between each and every cell in the human body. Other studies of the cell membrane and intercellular communication agree that ultimate communications are carried by packets of light energy, or photons. We may each be a lower resolution version of the phenomenon Universe, but we are still highly coherent. DNA transduces light and re-emits modulating electromagnetic signals. Fractal antennae interact directly with the field, transducing zero point energy. DNA emits and absorbs laser-like biophotonic light. In the scalar domain, cells absorb the virtual-state charge structure of their environment, and emit their own internal virtual-state charge structure to their environment. Light is stored, transmuted and transmitted holographically by DNA. Shifting the dipole creates a quantum harmonic oscillator. It produces quasiparticles called longwave phonons that produce sound. Standing waves are formed because the wavelength of the phonons equals the size of the DNA helix. Ultrasonic solitonic waves circulate continuously within the superconducting DNA, facilitating absorption and radiation of information. DNA atoms synchronize and become indistinguishable. Matter condenses from the virtual vacuum of absolute space via virtual replica. 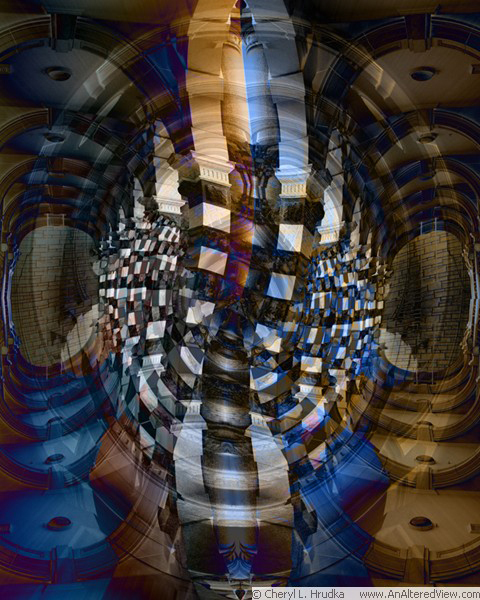 Condensed matter remains entangled with its virtual replicas. Virtual replicas are the fundamental ground of matter and living organisms. DNA can be modulated not only by excitation of nerve cells, but also by specific interaction with a virtual replica of one or more chromosomes (VR-DNA) of the same or other cells. DNA, may play the active and very specific role in Mind-Matter and Mind-Mind interaction. This implicates it as a possible mechanism for synchronicity, which includes both classes. Synchronization of chromosomes modulates the DNA structure and function enhancing quantum entanglement by induced combinatorial resonance. Alex Kaivarainen has suggested his model as a possible explanation of the psi field. Kaivarainen suggests a dynamic cell-type matrix of the Universe with superfluid and nonlocal properties, composed from non mixing microscopic sub-quantum particles of the opposite energies. Dirac’s theory points to equal probability of positive and negative energy in the Universe. The collective quantum excitations of sub-quantum particles and antiparticles form the correlated pairs, actual rotor and complementary antirotor, representing mesoscopic double cells-dipoles. The macroscopic structure is formed by the infinitive number of these cells-dipoles, unified in the form of virtual Bose condensate (VirBC) with nonlocal properties. The rotor and antirotor of cell-dipoles have the opposite quantized energy, virtual mass, spin, charge and magnetic moments. Spin includes the actual (measurable) and complementary (hidden) internal kinetic energiesof vortex and rotor. Synchronicity may be related to the sum of magnetic moments of the actual vortex and complementary rotor, a hidden magnetic moment of sub-elementary particles. Like cosmos, our DNA silently sings to us of our archetypal essence. In the East, it was called the audible life stream. Like time, it has rhythm and flow. Some coincidences can be mundane, while others are astoundingly dramatic and deeply meaningful at a very personal level. The later are characterized by their archetypal qualities, which resonate at the deepest levels between inner states and external events. Jung's archetypes aren't limited to characters. The term is derived from the Greek arkhetupon, first mold or model, in the meaning of being the initial version of something later multiplied. It icombines arkhos, meaning chief or ruler (used also in e.g. archbishop and monarch), and tupos, meaning mold, model or type. So, archetypes describe original or ideal model phenomena and characters, usually traceable to myth or theoretical models. Synchronicities give us a sense of greater wholeness, whether they are positive or negative. Both synchronicities and archetypes bring the depth dimension into sharper focus, resonance or resolution by forcefully grabbing our attention and emotions. Time ruptures and synchronicity twists it into weird circularities, and strange loops by linking our past, present and future. Complex archetypal dynamics unfold over time. Entanglement is so deeply enmeshed in the universe that a measurement in the past has an automatic influence on the future. Meaning unfolds in non-ordinary experiences. Archetypally informed synchronicity can be a form of integration, healing, reorientation, "quantum leap," "divine touch," or a demonstration of eternal cycles. Such anomalous events have phenomenological and aesthetic patterning qualities. Synchronicity projects or mirrors what is inside on the outside. Jung claimed that medieval alchemists were unaware of the natural process of psychological transformation which went on in their subconscious. Therefore, they projected this process into their experiments as a science of the soul. In other words, they projected an inner process outside of themselves. Had they been more conscious in their intent or more sophisticated in their psychology like the yogis, they might have been more consistently successful at producing the coveted lapis or Philosopher's Stone, with a sort of "quantum Tantra." Did they unconsciousnesly engineer a series of projected synchronicities? Does a similar path induce synchronicities in our lives? Revealing the hidden order in chaos, synchronicities can utterly change our personal orientation, awakening us to the ground of meaning and new levels of personal transformation. Such experience enlarges our perspective into an archetypal perspective. It makes us wink our archetypal eye in recognition of the numinous and imaginal smiling back from the abyss -- of space and the transcendent imagination. Archetypes link inner and outer experiences. Symbolic patterns are always with us, but in synchronicity they demand our attention as autonomous patterns of meaning. Synchronicity is always happening and can be either teacher or trickster, dream or delusion, benign or destructive, positive or problematic, telepathic or treacherous. Dreaming is an unbridled act of pure imagination. Jung defined archetypes as inherent, universal psychic behavior patterns, or templates of human experience. Such universal essences, unborn and unbound by time, are independent of our human minds. We imagine the collective unconscious embedded within the macrocosm, and so did our ancestors. Macrocosm and microcosm is an ancient Greek Neo-Platonic schema, recognizing the same patterns reproduced in all levels of the cosmos, from the largest to smallest scale. These specific configurations determine the laws of consciousness, and form the connection between the inner psyche and outer physical world. We can be astoundingly impressed or awed by the joy and fear that life and nature engender in us. They are psycholographic dramas, intimately linked with our life narratives. The world speaks through multidimensional symbols. Archetypes cannot be experienced directly, only through images, symbols, and motifs of their underlying archetypal coherence in the vast field of meaning. The archetype never comes fully into focus. Synchronicity is a mirroring of the same archetypal patterns that changes our perspective. The timing of life events can mirror psychological conditions. Synchronicities express the quantity and quality of such correlations of psychophysical phenomena. Synchronicities are concrete expressions of archetypal dynamics. They can be subtle or blatant. Cosmic sympathies -- the ancient code -- were reflected in the Hermetic doctrine of the microcosm mirroring the macrocosm, revealing the hidden depths of nature and human spirituality. "Above" and "below" are united by a universal substrate. In ancient times, to be born again in the circle was to be reborn again in the sky in regenerative form. The esoteric Correspondence System is a shorthand code for categorizing and ordering synchronistically-related symbols, including numbers, geometries, colors, planets, godforms (archetypes), plants, animals, metals, stones, spheres of the Tree of Life and tarot paths, etc. They are technologies for discerning and modulating the patterns of underlying flux emerging into manifestation from the superposition of the holoflux. Thus, we can interrelate qabalah, philosophy, psychology, physics, topology, mythology, astrology, and alchemy as metaphorical languages for relating to the collective unconscious, psychic aspects of our cosmic being. Astrology is perhaps its most well-known modality. Planetary positions mirror events in human experience. The Doctrine of Signatures outlines the dynamic interpenetration of archetypal sympathies. Intuition is a function of perception. Our ancestors made codified tables of such correspondences, a set of symbols, associations and qualities. They made tables for magically timing rituals and spells, and numerous means of divination for knowing and perhaps changing the will of the "gods". An oracle consultation is a conscious synchronicity, a microcosmic mirror of your macrocosmic orientation. This widens the scope of synchronistic potentials and invites interaction. For ages, mystics have used alphanumeric clues to the nature of words and the qualities of things. Many ancient alphabets are alphanumeric. There is some kind of metaphysical link or correspondence or analogy between what we know here and now and the great unknown. Like archetypes, an essential characteristic of synchronistic events is an emotional or psychic charge that makes them meaningful, producing a numinous effect on the person experiencing them. The meaning of a synchronistic event requires that it be understood symbolically, not just intellectually. They originate in the archetypal realm, which is eternal, existing outside time and space, and seem to have a pre-established order before crossing the threshold of consciousness. Jung said that archetypes have a dual nature that is transgressive, existing in the realm of both psyche and matter. Archetypes are the link between the physical and the psychic world. Synchronicity provides access to the archetypes, which are located in the collective unconscious. Archetypes don't cause the events, but reflect certain facets of their potential in endless fractal-like reiterations. How many such significant correlations you notice depends somewhat on the psychosensory vocabulary you have to identify them -- the terms and qualities of the connections. Naturally, there is an inherent suggestibility in such filtering systems. Visionary states and other vivid episodes of archetypal activation provide no guarantee of objective truth, validity, revelation, or even psychohygienic value. They are certainly no conclusive indication of “gnosis,” theophany, or revelation, as Jung himself was well aware (Jung, 2002). Such experiences are deeply ambiguous, both cognitively and morally. They can obsess, distort, and figuratively hijack human consciousness as much as they enrich and liberate it in other circumstances. Synchronicities and other paranormal events can act in the service of an individual’s unconscious self-destructive tendencies. Mishlove has observed similar cases in his own psychotherapy practice. This author (Miller) concurs, likewise based on clinical experience. A skeptic, Dr. Surprise warns that, "They reflect both conscious and unconscious mental processes, and can therefore seem to be from outside our awareness, but they are not. It’s a mirror of our psychological energies, for lack of a better term. We experience what we think. This is both wonderful, and potentially a cause of delusion and confusion. Once Jung started thinking about archetypes, that’s what the mirror of synchronicity showed him. He mistook this for a confirmation of his beliefs." Is Reality a series of metaphors set into motion by the synchronicity of archetypes in the complex network of our self-organizing unconscious? Curiously, that isn't far off from what physicists say in their own technical language -- quantum reality in a holographic universe is profoundly subjective. The fundamental process of nature lies outside spacetime but generates events that can be located in spacetime. Skeptics argue that in Jung's breakdown period, he stared too long and hard into the magic mirror of his own depths. In a fugue of apophenia, the ability of the human mind to find meaning and significance where there is none, he came up with the notions of the collective unconscious, archetypes, and synchronicity. Such a model, an "error" of interpretation or not, can still be taken metaphorically and used for navigating the finer realms of consciousness exploration. It is important to avoid making the mistake of construing connections that are in fact authentically significant and valuable as meaningless or false. After all, no scientist can escape the mythic elements of his own theories. There is nothing wrong with attempting to grasp the basic of the patterns of human life or understanding how our perceptual and conceptual systems work. It led physicist Pauli to the principle of complementarity of physics and psychology. Quantum theory and the uncertainty principle tell us that we cannot picture nature but can only predict the results of specific experiments. These results will depend on how we choose to perform our experiments. Not only are we blind to the workings of nature, but even our brief glimpses are of no objective, independent reality but of a subjective, observer-determined world. All our knowledge of the physical world comes via our subjective experience, so it appears to have an existential status complementary to the physical universe. Synchronicity is a type of mirroring. Time seems to loop back on itself self-referentially like a strange attractor, polishing the mirror of the mind. Bearden refers to the scalar ocean of energy as the enfolded "time domain". Phase conjugate mirror production of time-reversed EM waves blows away the forward-time assumption. The time-reversed wave phenomenon is a universal phenomenon of nature, not just a fluke, and not just a "nonlinear optics" phenomenon. It is a solution to the wave equation and, as such, it applies to every kind of wave. Electromagnetic, sound, magnetohydrodynamic, and other radiating systems all exhibit the phenomenon under appropriate nonlinear conditions. Reversal of electric charge is also a time-reversal, and vice versa. Time reversal of a fundamental plus harmonics can produce a stronger fundamental. A nonlinear mass can act as a phase conjugate mirror (PCM). There are really two major kinds of photons: (1) the "normal" photon carries positive energy and positive time. (2) the "time reversed" or phase conjugate photon carries negative energy and negative time.Can we describe synchronicity as time reversed wave real-time holography? The backward-traveling wave is, in essence, a time-reversed replica of the original incident wave. One of the 2 waves in each pair has to be a time-reversed. The nucleus of an atom can be teated as a pumped phase conjugate mirror. The future isn’t what it used to be in this negative-time reversed paradigm. It is the Bizarro World of materially unstable ghosts, sasquatch, UFOs, ETs, ultraterrestrials, angels, demons, imps, and overunity, which can all bleed into and out of normal reality. The virtual blueprints of everything that ever was or will be, as well as the powers of mind linkage, mass mind control and healing are locked in this universal zip drive. Time reversal (TR) is the process of recording, time-reversing and re-propagating the signal. When the signal is from a localized source, the time-reversed field is expected to focus on the source. Time reversal of acoustic waves has led to applications in ultrasound and underwater acoustics including brain therapy, lithotripsy, nondestructive testing and telecommunications. An even greater potential holds for the time reversal of electromagnetic waves which is closely related to optical phase conjugation. Psychologist M-L von Franz writes that the notion of complementarity introduced by Niels Bohr provides a better explanation for the paradoxical relationship between waves and particles in nuclear physics. It can also be applied to the relationship of conscious and unconscious states of a psychic content. This fact was discovered by Jung, but it was particularly elaborated by Wolfgang Pauli. Despite the ephemeral nature of mind, the root complementation between subjective experience and objective reality implies that our consciousness is also, in some sense, a founding cosmic aspect. Jung concluded that the archetypes have not only psychic reality but also relate in some fashion to the spacetime continuum. We are faced with the mirror of Quantum theory and the uncertainty principle. They tell us that we cannot picture nature but can only predict the results of specific experiments -- and these results will depend on how we choose to perform our experiments. Not only are we blind to the workings of nature, but even our brief glimpses are of no objective, independent reality but of a subjective, observer-determined world. Physicist Nick Herbert is specific on the similarities between Quantum Theory and consciousness. Consciousness is a pervasive process in nature. Mind is as fundamental a component of the universe as elementary particles and forces. Mind can be detected by three features of quantum theory: randomness, thinglessness (objects acquire attributes only once they are observed) and interconnectedness (John Bell's discovery that once two particles have interacted they remain connected). Herbert thinks that these three features of inert matter can account for three basic features of mind: free will, essential ambiguity, and deep psychic connectedness. will, perhaps to be equated with “spirit”. The material world of "consensus reality" is the interference pattern of the sum of all individual, subjective, realities. All physical systems are inherently conceptual because experiences and observations are subjective. What limits perception of authentic synchronicity? The automatic assignment of meaning. We often unconsciously assign meaning to events whether they are inherently meaningful or not. When this automatic mental action happens around coincidences, it can create the deep and meaningful illusion of synchronicity. Discerning between assumed or projected meaning and an open perception of the innate meaning of an event demands a consistent process of reality checking our perceptions if we are to bypass self-delusion. The mystery of the Observer pervades quantum physics and archetypal psychology. Reality-testing need not apply if we aren't being literal, but in the "as if" realm of the psyche, the imaginal. It doesn't need to be any more "real" than an intentional dialogue with a planetary power, or some other technique that functions as a thought experiment. Such interaction changes attitudes, which has realtime effects on behaviors and emotions. Further, synchronicities come to us; we don't conjure them up before the event. But they are undeniably tied to our belief systems -- at least their interpretations are. Some say 'paranormal,' while others are content with an attribution of 'random coincidence'. Jung invites us into the unexplored depths of subjective experience, our own private virtual reality. Meaning can only reside in our own subjective perception of whatever reality is out there. According to both Jung and physicist F. David Peat, the sense of meaning or value is far from being loose and subjective for it can be as rigorous and objective as logical thought. It is this objective sense of value and meaning that enables us to recognize the occurrence of a synchronicity or meaningful linking between inner and outer, the self and the natural world. But if meaning were no more than the purely subjective, or personal idiosyncrasy, then synchronicity becomes trivialized into nothing more than anecdotal and superficial coincidence. Why do we tend to look for signs of guidance and meaning outside ourselves to reinforce or plan our next move or gauge our optimal performance (flow)? Is it serendipity, precognition or selective perception, or a deep emergent order? Is intuition part of it? Synchronicity is an explanatory concept for the unaccountable mystery of chance or simultaneity, not a scientific or psychological fact. It is about the subjective quality of the moment, relationships in time...the right person, at the right place, at the right time. The serpent of being bites its own tail. Jung noted three types of mind-boggling phenomena he classified as synchronous anomalous events: the coinciding of a thought or feeling with an outside event; a dream, vision or premonition of something that then happens in the future; and a dream or vision that coincides with an event occurring at a distance. Subjective/objective duality seems to collapse for an instant in concurrent physical/psychic union. Half of the pattern seems to exist "out there" in matter, as well as "in here" in our minds. Psychic conditions manifest. Synchronicity is external; intuition is internal. But the coincidental experience dissolves the boundaries in an undivided convincing felt-sense awareness, that feels more like witnessing than generating the event. We suspend judgments and concepts. Sometimes we blow them all out of proportion. Is this is the creative edge of our awareness? Non-verbal felt-sense is often metaphorical. Later, the metaphor tells us what the experience was "like". Our beliefs dictate how we frame, attribute, or describe such uncanny psychic experiences. Scientists suggest a theoretical basis for synchronicity in quantum physics, fractal geometry, and chaos theory. Entanglement shows how the isolation and separation of objects from each other is more apparent than real. When two photons are separated, no matter by how far, a change in one creates a simultaneous change in the other. Is the vacuum information self-organizing and feeding that back to us in some coordinated fashion when we are "in synch"? Is it a reality or a perception? A complementarity in the arising of similarities might be considered a parallel to the wave/particle paradox. The belief suggested by quantum theory and by reports of synchronous events that matter and consciousness interact, is far from new. Synchronicity reveals the meaningful connections between the subjective and objective world. Synchronistic events provide an immediate religious experience as a direct encounter with the compensatory patterning of events in nature as a whole, both inwardly and outwardly. Synchronicity has been called by many names. In traditional Indian religious philosophy it is referred to as karma. It is likewise regarded as a fundamental aspect of the Tao in which nature, chance and conscious represent three features of one manifestation of the cosmic creative force. It is likewise in the 'implicate order' (Bohm) of quantum non-locality as expressed for example in the transactional interpretation and in such ideas as morphic resonance (Sheldrake). Is our psychophysical being embedded in deep reality in a similar manner that occasionally reveals itself, even as paranormal or is that just our misplaced mystical enthusiasm? We like to think so, and connecting those dots fascinates many with a spell that could be considered "archetypal". Such events shatter our assumptions. We love such mystery, even when it is uncanny or frightening. It creates a sense of transpersonal magic at work in our lives. Often, these are experiences we value, landmarks on our map of mind and matter. What we do with such anomalous knowledge or wisdom is perhaps as, or more important. We are equipped from birth with mirror neurons which allow us to imitate and respond to our environment and caregivers. Does the universe also mirror our multidimensional being with responses that trigger our essential connections? Perhaps the data field orders itself into meaningful probability shocks at the creative edge of chaos. Mirror neurons are involved in much more than "imitating" motor actions in one's brain when watching someone else performing a motor action. They are now thought to be involved in emotional bonding, empathy and language. Mirror neurons also play a role in the development of a sense of self. Are they influential in our perceptions of the cosmos smiling or frowning our way? Communication, in general is characterized by the relative Influence and richness of synchronicity. Mirror neurons are connected to the limbic system (responsible for our emotions) by the insula. Our own mirror neurons are activated by the sight of someone's expressions, as if we made them ourselves. The neurons also send signals to emotional brain centres in the limbic system that make us feel what other people feel. Can we extend this metaphorically to our relationship with cosmos via synchronicity? Far from being a mere fantasy of the psyche, synchronicity may express fundamental connections at the very ground of cosmology. The collective unconscious or subconscious is a term for this mysterious and fluid interface between dream memory and reflection. Apparently ancient images at the founding of our cultural mythologies were Jung's basis for the term archetype, the fundamental upwelling universal images which seem to recur as a futuristic echo in the modern mind of the very founding roots of culture. Synchronicity is the bridge between matter, mind and the eternal. Synchronistic events are those subjective experiences that make up life's meaningful coincidences. Some seem more meaningful than others; some are "just so" stories. Is it a feedback, feed-forward mechanism, an encoded orthogonal zip-file in hyperspace that downloads in that magic moment? Things often fall apart, but sometimes they fall together in the probability field. Such transformative points can be life-changing quantum leaps in self-awareness. The issue is one of 'similar things' that seemingly stop the arrow of time dead in its tracks, forcing us to take notice of the extraordinary, the mysterious.Thus, synchronicity is essentially insight into hidden confluence.The synchronistic totality of all conscious and unconscious self-organizing processes has its own psychic structure. Psyche and substance are two aspects of more fundamental energy, which forms a universal substrate. The delineation between mind and matter blurs. Synchronicity is a recognition process bridging mind and matter that slaps you in the face and wakes you up. It is an artistic act, a holistic improvisational aesthetic that uses actual surroundings and (synthetic) synchronicities from which to create new expressions in any medium or discipline. It is an intuitive act that is at once intentionally connective with source and presence, thus freeing and directing that which is inside desiring to emerge. Jung conceived the archetype as a recurring image that wells up in consciousness from the collective expressing existential themes which are universal and underlie the common myths and experiences underlying the existential nature of culture itself. Although he often described these as static and ancient features of mystical and religious vision, his access to them was through the ever changing and recurrently futuristic avenue of the vision welling up from dreams, trance states and mental reflection. Thus while the archetype does have an ancient basis, it nevertheless emerges in the present in the evolving expression of existential history as it becomes our unfolding future. Some consider their synchronicities messages from God or the divine. Despite including God among his archetypes and expressing God in the self as a central visionary aspect of his own experience, Jung prudently refused to commit himself concerinng the metaphysical existence of God: "The self was important to Jung and in the self he saw the god image being alive at the center. He did not wish to discuss the existence of God because this was a metaphysical question which he was not prepared to go into, but in the psyche was the God image within one's self. The God image changes. God does not change" (Matter of Heart - TV). Like archetypes, synchronicities are patterns that repeat in time. Like archetypes and relationships, such experiences are not all "good." Jung thought when an archetype is activated by an emotionally charged event (such as a tragedy), other related events tend to draw near. In this way the archetypes function like a doorway that provide us access to the experience of meaningful or insightful coincidence. When we come to the end of our rope, does the cosmos throw us a lifeline? Jung suggests that archetypes are metaphors, principles that somehow organize the unconscious. Jung thought archetypes are more likely to bring ideas into consciousness at times of emotional tension. So he associated synchronicity with the erupting of archetypal material into consciousness. Von Franz confirms that the archetypes might just as well be called "patterns of human behavior". Synchronicity can be viewed metaphorically. And that includes numbers as archetypes. Metaphors are "how we know what we know", relating the known to the unknown. When metaphors are synchronistic, emergent, spontaneous, self-organizing expressions of our dynamic stream of consciousness, they are an imaginal encoding of information that bridges the domains of conscious and unconscious worlds, material and transpersonal realms. Such metaphors can be deeply transformative -- more than mere language. They are a technology for changing our behaviors, feelings, thoughts, and beliefs. Intentional contact and immersion in these metaphors can transform our spirit and soul. Jung claimed synchronicity bears directly on our notions of things being connected in time. In archetypal psychology synchronicity has been superseded by the concept of chronicity, the chronic re-appearance of dynamic archetypal patterns. With the introduction of chronicity to our discussion, we have found the god within our fantasy - Chronos, he who binds us to the physical form, he who devours his own children. As the Lord of our local universe, Time assures our imprisonment within the Creation, the material Universe. Mystics have an inherent yen to escape the bounds of time and space, and seek their spiritual home in the universal field. As long as we are material, our consciousness finds causality problems. These conceptual conundrums prevent the mind from entering the realm of the pure archetypes. We perceive only dim reflections of their effulgence, but we must "see through" the literal nature of reality, even to accomplish this task. Synchronicities bust us out of normal consensus reality into an open state. The problem becomes not one of how to know something radically new, but how to learn something radically new. Thus metaphors are instructive. They are a central Way of leaping the epistemological chasm between old and new knowledge, old and new ways of essential being. Metaphors help us makes this leap, help us enter a problematic situation in order to solve it, to explore it, and explore the world restructured by this metaphor. We can tap the source of creativity, healing and holistic restructuring through imagination and metaphor. The possibilities for concepts and thought are shaped in very special ways by both the body and the brain that evolved to control it, especially the sensory-motor system. Conceptual metaphors appear to be neural maps that link sensory-motor domains in the brain to regions where more abstract reasoning is done. This allows sensory-motor structures in the brain to play a role in abstract reasoning (Lakoff, 1999). fundamental to the nature of the perceptual mechanism. Perceptions take place in a constrained contextual field of experience and being. We operate within such a bubble of experiential perception in the probability field. Our mirror test is the entire universe, and it reflects the meanings your mind creates. Do we create our own coincidences with our interpretations of emergent events? Is it a paramorphism? A paramorphism (from Greek παρά, meaning "close together") is an extension of the concept of catamorphism to deal with a form which “eats its argument and keeps it too, a way for pattern matching to cohabit with data abstraction? We read a depth into our experience which may or may not be there. The empty space is filled with meaning, changing the perceived depth. The illusion of perception is so compelling that we mistake the percept of the world for the real world itself. As ever, the world we see around us can only be an elaborate, though very compelling, illusion, which must in reality correspond to perceptual data structures and processes occurring actually within our own heads. The central message of Gestalt theory is that the primary function of perceptual processing is the generation of a miniature, virtual-reality replica of the external world inside our head, and that the world we see around us is not the real external world but is exactly that miniature internal replica (Lehar 2003b). Everything else is occluded as hidden information. Phenomenology is an art, not psychological or neural science. It is a matter of "seeing as though," or "seeing as". Some synchronicities are obvious to others, some only to ourselves. We resort to art when we cannot articulate our vision with concepts alone, when our reach exceeds our grasp. The alchemical art is a synchronistic unification of psyche and matter as numinous reality -- aesthetic arrest. We dissolve in the mysterious ground of being, the sublime wellspring of creativity. The mind goes still as primal awareness expands into wholeness. Something without physical form shines forth from the hidden world in that very moment. These luminous experiences, true works of art, drive us onward. We are struck with divine inspiration and the passion to see it through to completion. Sensuous cognition of beauty is a revelation, an astonishment that captivates our rapt attention. We are directly connected to beauty and wholeness. We know what it means to exist rooted in the mysterious creative ground of being. As artists we are mythmakers, dreaming the alchemical dream onward. Myth is transparent to transcendent process in the Now-Here. In sublimatio we reach escape velocity. In aesthetic arrest, the phenomenal field disappears as we come to our own Zero Point. The oneness of existence transcends our conscious comprehension, insisting on a comprehensive symbol. In a moment of synchronicity, it is the vehicle of transcendence. When we have gone out and been overwhelmed by ten thousand outer things, we can make them one through the image of the One Mind. The paradoxical shift is orchestrated by psychophysical being. Our perceptions are embodied in the moment of synchrony. Forces at our perceptual edge tend to merge, to meld. When we see order in the configuration we call it synchronicity because it changes our perspective. We give it more 'weight' than ordinary experience as it feels uncanny. Sometimes we anchor onto it as a milestone that utterly changed us, like a bubble that pops revealing another dimension of being -- understanding without words. Perception of what is real and what is not dims and vanishes in a whirlwind of synchronicities. Sometimes they comein fugues. Imagination is reality. Magicians understand the world we live in, or think we live in, is an illusion, a construct of our own perceptual apparatus and a malleable interpretation of our brains. But the hyperdimensional gifts of the Spirit come at a price. The magician taps into, becomes one with, an essence that pop culture calls The Force. Information controls and patterns energy. Our reality is literally a massively simplified construction of the patterns our brain thinks most important at any given moment. Finding meaning between patterns, between events, is what we do best. Synchronistic events defy the way we usually think about cause and effect. Finding the cause seems impossible and gives us existential vertigo. Synchronicity is a level of observation. Universal energetic field slumbers at the center of the Universe. A hidden Dragon sleeps within our deep nature and guides our collective destiny. All the virtual and electromagnetic waves bathe all things in this radiation, in their motion. The universal ether is the fundamental light frequency or form of ‘pure energy’. It reflects the hidden energy of our cosmic entanglement. All other forms of energy are a modification of this primal energy, creating the impression of a concrete physical world, along with the astral impressions of the imagination, and the various sensations and perceptions that accompany human existence. It appears that reality has two aspects: the underlying field continuum, and the nature of the form perceived in it. 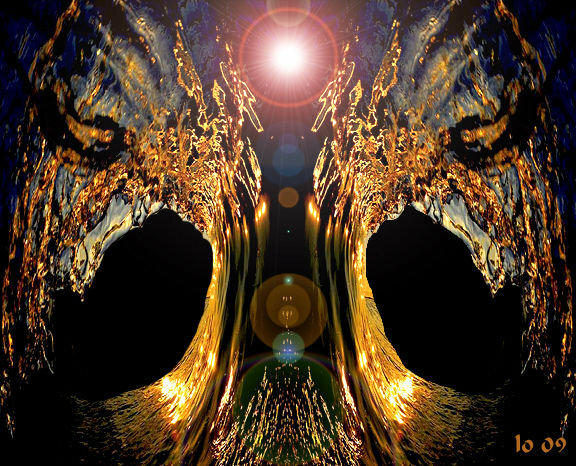 Through miniscule perturbations, waves can change to forms and images that can speak, becoming voices that can be heard by our sensitive energy bodies, feeding on biophotonic light. Sometimes they amplify to the macrocosmic scale. Our mirror test is the entire universe, and it reflects the meanings your mind creates. Synchronistic events appear caused by whatever the observer believes causes them. Looking for such events consciously, knowing they are a mirror of your thoughts, reveals your astonishing ability to shape your experience of the universe according to the thoughts you choose. Does our human associative capacity, expressed as archetypes, mirror an associative universe? The mirror amplifies and connects consciousness into "psychic sonar". We see in the mirror of events around us the image of our own inner life. We see what we think, feel and believe. Synchronistic events are those uncanny coincidences in which the environment seems to be speaking directly to us through events. They can become touchstones or points of reference in our lifelines. Babies like what they see when they look in the mirror. Recognizing yourself in the mirror is a major feat because it requires self-awareness. Only around 18 months to age two is a child really aware of himself as a separate physical and mental being. Especially through the first year, babies experience themselves and their parents as part of the same entity. Age two is also when children start to show embarrassment, which requires a level of self-awareness, and refer to themselves using "I" or "me." Scientists think the anterior cingulate and frontal cortex (responsible for advanced functions like memory, planning, and attention) are involved. The frontal lobes lag considerably behind other brain regions in development. Once the lights go on in the frontal cortex, a baby starts to gradually accumulate all the advanced reasoning and awareness that makes us human. One of the ways babies develop self-awareness is through relentless imitating. Do we mirror the environment or does it mirror us? Why does it surprise us when it happens? Synchronicity is an existential form of mirror test, a measure of self-awareness, and the ability to recognize ourselves in the mirror of self-reflection and self awareness. In mythological times reflective surfaces like shiny mirrors were credited with the ability to reveal the future. NASA is uses mirrors to do just the opposite – look into the deep past. Beyond synergy, synchronicity reveals local convergent information, sometimes with an uncanny or numinous felt-sense. We traverse events by association, by pattern recognition. Synchronicity is a mirroring gestalt of our perception and the world at large -- a resonating gestalt, a bubble of hyper-coincidence that triggers a holistic global perception and response of recognition of our deeper connection to reality. Direct (naive) and indirect realism (representational) appear to merge in a holistic moment. 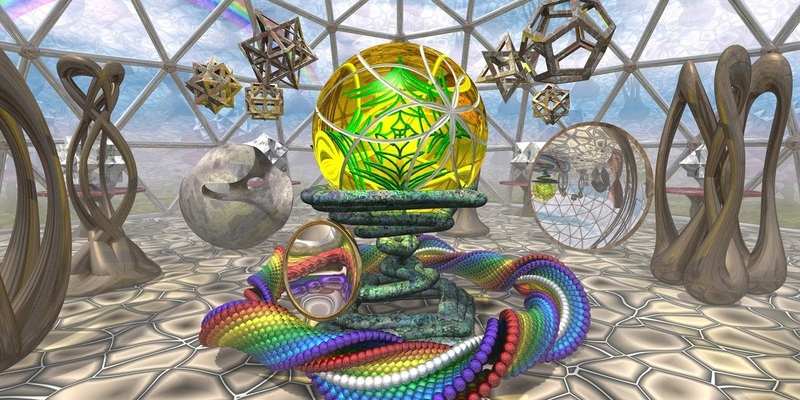 The perceptual modeling of synchronicity is holographic. Such gestalt bubbles frame emergent experience and perception, generating a fully spatial virtual-reality replica of the external world in an internal representation. Some frames are more synchronized than others and punctuate our experience. Such a top-down approach to perception and subjective experience with meaning is valid and complimentary to other modes. We must first understand Jung's notion of the archetype. Jung refers to the Archetype as the 'type' in the psyche, an inner mental image (type being derived from the Greek tupos meaning imprint or blow). Though an archetype as an imprint presupposes that there was an imprinter in the first place, Jung does not concern himself with this, rather he concentrates on the image within the collective unconscious that dominates when there are no other rational thoughts. The unconscious is said to modify the conscious. Jung's idea of the archetype as a primordial Image required that it was at least common to entire cultures, or entire epochs, the most powerful archetypes being common to all of humanity at all times. It also required that the image was in close accord to the ancient myths and symbols. The ancient symbols were supposedly created from the collective unconscious to explain certain phenomena of the world. Many people agree with the statement that everything you perceive is in some sense inside your head, and in fact they often complain that this is so obvious it need hardly be stated. However, when that statement is turned around to say that out beyond everything you perceive is your physical skull, they object most vehemently that that is absurd. But the two statements are logically identical, so how can one appear trivially obvious while the other seems patently absurd? The value of this particular mental image is that it helps to smoke out any residual naive realism that may remain hidden in our philosophy. For although this statement can only be true in a topological, rather than a strict topographical, sense, this insight emphasizes the indisputable fact that no aspect of the external world can possibly appear in consciousness except by being represented explicitly in the brain. Jung's synchronicity is a concept of acausal yet meaningful coincidence, a spiral of weird coincidence into a vortex of implausible synchronicity. Serendipity and synchronicities require fluidity of imagination, an inner eye for what could be important to incorporate, as well as fluency in technical procedures. But some beg to differ. Is Jung's synchronicity his own mythic creation - a modern myth from the emergence of quantum physics? 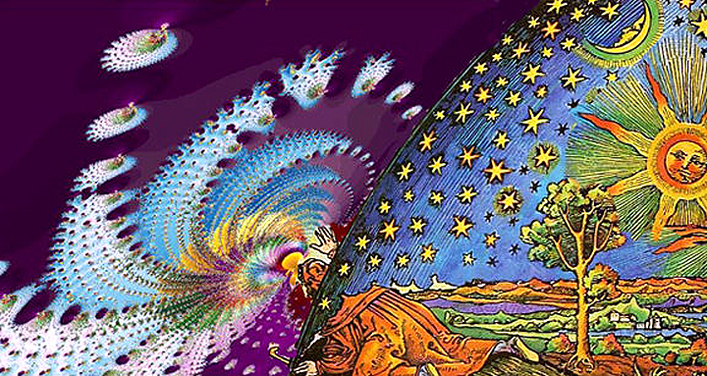 Jung created the term, speculating that synchronous events were created by patterns he called archetypes. These universal patterns of creation existed somewhere outside of time and space, and caused events to cluster around them in patterns. Is there more to it? Perhaps both notions are true. People see in the mirror of events around them the image of their own inner life. They see what they think, feel and believe. They even see their fantasies about what causes these reflections. For some it is the stories they tell themselves about the causes of the weird events, not the synchroncities themselves, that label them as symptomatic. Everyone has experienced meaningful coincidences. They are explained by supernatural and religious beliefs, archetypal influences, or more exotic personal mythologies. Synchronicity mirrors these beliefs back to the observer. Synchronous events are sometimes mistaken for confirmations of the objective reality of personal beliefs. Most people are looking into the mirror of signs and synchronicities every day. They don’t realize the images they see are their own thoughts. You have an amazing ability. Your thoughts and feelings, your memories and experiences, are reproduced in the events around you as coincidences. The world shapes itself around your thoughts, presenting you with meaningful coincidences based on your inner life. Everyone creates their own synchronicity, constantly. The ability is innate to the way our brains process information into meaning. This seemingly magical ability goes largely unnoticed, unexplained and misunderstood until it presents itself in spectacular form. Jung’s acausal theory of synchronicity was a step toward a complete theory of the symbol. Hogenson (2004) suggests symbolic systems obey the same rules of scaling as other systems. Symbolic systems can therefore be understood as exhibiting the characteristics of a power law distribution, which led to the discovery of fractals. Mandelbrot realized that the exponent in a power law defined a pattern of self-similar structure in the phenomenon under investigation that was “scale invariant” — fractal. A power law means that there is no such thing as a normal or typical event, and that there is no qualitative difference between the larger and smaller fluctuations. Scale-free power laws reveal a lack of any expected size for the next event. Upheavals are not unusual. A big event need not have a cause. The causes that trigger a small change on one occasion may initiate a devastating change on another, and no analysis of the conditions at the initial point will suffice to predict the event. The famous example of the “butterfly theory” in chaos theory was understated, as the butterfly would be only one event that led to the hurricane’s emergence. Jung described synchronicity as a juxtaposition of a psychic state with a state in the material world that resulted in the emergence of meaning and a transition in the individual’s state or understanding of the world. Emergence is a phenomenon associated with systems. Synchronicity is an aspect of the symbolic that exhibits a high degree of “symbolic density.” Tuning is crucial to reach a critical point in which any tiny event can trigger a huge upheaval. Sometimes criticality can be tuned by nature on its own. Each theme has its archetypes. Archetypes are universal concepts determining a probability field. All the most powerful ideas in history are rooted in archetypes. When the density of symbolic activity reaches a steep pitch, a phase transition or a symbolic avalanche is precipitated and radically reorganizes the whole subjective/objective world. What counts in the critical state is the simple underlying features of geometry that control how influences can propagate. Fractals and power laws are at work in settings where the critical state underlies their dynamics. Fractals can be produced by chaos, but they also arise in processes of growth or evolution. Dynamic phenomena manifest physical and energetic characteristics which are archetypal. Criticality is an archetype describing natural phenomena. Organizing criticality” occurs at a bifurcation or saddle point of crisis/opportunity. Thus, psyche is a self-organizing, self-similar domain. Most phenomena are smaller in their own right, but self-similar to the great events of the collective unconscious. The system reflects on or mirrors itself. The “objectivity of the psyche” is a self-reflective capacity, evident as modes of consciousness, then retrojected, somewhat modified, back into the psyche. The symbolic world is characterized by phase transitions, that occur at the threshold of phenomenal transformation. An associative network shapes the psychic reality of the individual. Associative networks (gestalts), complexes, archetypes, synchronistic events and creative emergence become evident through a series of self-organized critical transitional moments that result in phase transitions within the symbolic system as a whole. They are the result of small symbolic developments that don’t stop. Small symbols add together into denser symbol sets with chaotic structure. Details are not important in deciding the outcome. In the Journal of Analytical Psychology, Saunders, a mathematician, and Skar, a Jungian analyst, argue that the developmental forces usually thought to originate from the archetype arise instead out of the complexes, which are formed through self- organization in the brain/mind. In this view, the “archetype” is not something that forms the complexes; it is a class of complexes which fall into the same general category (Saunders and Skar 2001). Archetypes represent something as a state of self-organized criticality, an “iterative moment” of psychic synthesis. Archetypes are emergent properties of developmental processes. Given that archetypes exist, how do they come into being and how can the idea of archetypes be aligned with advances in scientific thinking? Hogenson says the archetype does not exist, in the sense of being a discrete ontologically definable entity with a place in the genome or the cognitive arrangement of modules or schemas in the brain. 2. The coincidence of a psychic state with a corresponding (more or less simultaneous) external even taking place outside the observer's field of perception, i.e. at a distance, and only verifiable afterward. a) The intrapsychic state and the objective event as meaningful parallels. d. The archetypal level of meaning [transcends the individual and implies absolute knowledge]. Social semiotics is a branch of the field of semiotics which investigates human signifying practices in specific social and cultural circumstances, and which tries to explain meaning-making as a social practice. Semiotics, as originally defined by Ferdinand de Saussure, is "the science of the life of signs in society". Social semiotics expands on Saussure's founding insights by exploring the implications of the fact that the "codes" of language and communication are formed by social processes. The crucial implication here is that meanings and semiotic systems are shaped by relations of power, and that as power shifts in society, our languages and other systems of socially accepted meanings can and do change. Social semiotics is thus the study of the social dimensions of meaning, and of the power of human processes of signification and interpretation (known as semiosis) in shaping individuals and societies. Social semiotics focuses on social meaning-making practices of all types, whether visual, verbal or aural in nature (Thibault, 1991). These different systems for meaning-making, or possible "channels" (e.g. speech, writing, images) are known as semiotic modes. Semiotic modes can include visual, verbal, written, gestural and musical resources for communication. They also include various "multimodal" ensembles of any of these modes (Kress and van Leeuwen, 2001). Social semiotics can include the study of how people design and interpret meanings, the study of texts, and the study of how semiotic systems are shaped by social interests and ideologies, and how they are adapted as society changes (Hodge and Kress, 1988). Structuralist semiotics in the tradition of Ferdinand de Saussure focused primarily on theorizing unchanging semiotic systems or structures (termed langue by de Saussure). In contrast, social semiotics tries to account for the variability of semiotic practices termed parole. This altered focus shows how individual creativity, changing historical circumstances, and new social identities and projects can all change patterns of usage and design (Hodge and Kress, 1988). From a social semiotic perspective, rather than being fixed into unchanging "codes", signs are considered to be resources which people use and adapt (or "design") to make meaning. In these respects, social semiotics was influenced by, and shares many of the preoccupations of pragmatics and sociolinguistics and has much in common with cultural studies and critical discourse analysis. The main task of social semiotics is to develop analytical and theoretical frameworks which can explain meaning-making in a social context (Thibault, 1991). Semiotics is the study of signs and significance. How does something become significant? How does meaning happen? What exactly is meaning? Where does meaning come from? Since meaning means a whole lot to us, semiotics should too, and yet most of us have never heard of this academic discipline. In everyday life, we have two conflicting assumptions about signs and their meanings. One is that a sign is a thing with intrinsic meaning. The other is that a sign is not a thing but an evolving relationship, an interpretation process that plays out over time. The schools of thought in semiotics reflect these two very different assumptions. Between these two approaches, the first dominates both in academics and everyday life. When we say “It’s a sign,” the word “It” usually refers to a thing, a physical something that means and therefore is a code for something else. A sunset is a sign that night is coming. A weather vane is a sign for the direction of wind. The word “dog” codes for a canine animal. From this perspective, it’s all writing on the wall, real things that mean something clearly, directly, and specifically. Consistent with this intuition, many semioticians treat signs as coded in one-to-one correspondence to the things they mean. These academics work to catalog and categorize kinds of signs—so for example, a weather vane is an index, a thing that points, and the word dog is a symbol, an arbitrary scribble that in English always codes for canine animal. Semiotics of this sort collaborates with the kind of linguistics practiced by Noam Chomsky, an attempt to reverse engineer all of language into a coding system, the brain’s equivalent of a computer code. Though this is the prevalent school of thought, it can’t be the whole story. The other school argues that a sign can’t be a coded link between a thing or “sign vehicle” and what it represents because in the right context absolutely anything can become a sign. Heck, even the absence of a thing can become a sign. The absence of your tax return on April 15 means something to the IRS. The absence of an anniversary gift means something to your partner. And the meaning of a sign can be quite varied. A shovel lying in your yard can mean your teenage son is still careless, the pet hamster has died, someone is cleaning out the garage, or a murder has taken place. A sunset can be a sign to knock off work, pour a glass of wine and smooch with your partner, or that the world is still rotating on its axis. The word “dog” means different things in dog days, dog tired, dogged, lucky dog, dog and pony, dog-eared, and what’s up dawg?—to say nothing of Swedish, in which the sound “dog” means “day.” There’s no one-to-one coding even with “dog,” a relatively straightforward word. Anything can become part of an evolving relationship of significance, but not everything does. To semioticians of this second school (to which I belong), how these relationships of significance form becomes the big question. For practical everyday purposes, there’s something to both schools of thought. Fundamentally, significance has to be the evolved three-way relationship between a sign vehicle, what it means, and you, with meaning changing over time. But sign vehicles do stabilize, meaning the same reliable things for lots of people over lots of time. So of course, we would act sometimes as though the sign vehicle is directly coded to its meaning. It’s interesting to watch people shuttle back and forth between the two schools of thought, shifting between absolute meaning-formulas like “X always means Y,” and evolving bet-assertions like “In this case, at this time, I’m going to bet that X is best interpreted as Y.” The former approach allows no room for reinterpretation. It assumes the sign vehicle always and forever means the same thing. The latter approach, though it can be plenty firm, does allow some room for reinterpretation, which may explain why the latter approach often looks weak in debate. If you’re arguing over interpretation with someone who doesn’t believe in interpretation, someone who believes there is one right way to read a sign and all the rest are just mistakes, leaving your mind slightly ajar is going to make you look the most ready to surrender. Call it the “absolute advantage,” a term with two meanings, the absolute negotiation advantage surrendered to those who are absolute. The absolute advantage is unfair, unjustified, and dangerous. The “X means Y” school breeds fundamentalist bullying that has caused the world a lot of trouble and still does. I’m interested in how we interpreters can counter the absolute advantage. The conservative pundit William F. Buckley ridiculed the liberal as “someone who doubts his principles even as he’s acting on them.” I agree with his description but not his ridicule. One should doubt one’s principles even as one acts on them. That’s a virtue not a vice, and it shouldn’t be turned into a disadvantage in debating fundamentalists of any stripe, liberal or conservative. Meanings do evolve. People think evolution is about how things change, but evolution is at least as much about how things stay the same over time. Evolution is really about the tension between stability and change. Semiotics, as the study of how meaning evolves, offers us scientific hints at the relationship between stability and change, determinism and free will, yang assertion and yin flexibility—and politically, conservatism and conservationism on the one hand and liberalism and libertarianism on the other, the two schools we swim in all the time in the great and wonderful seas of meaning. T. E. Bearden, "Giant Negentropy from the Common Dipole," Journal of New Energy, 5(1), Summer 2000, p. 11-23. Bearden reinterprets Whittaker's 1903 decomposition of the scalar potential, where a Whittaker phase conjugate pair of longitudinal EM waves becomes a time-polarized EM wave interacting with the usually assumed unit point static charge, followed by emission of the longitudinal EM energy in 3-space. Thus Whittaker's decomposition is extended to wavepairs where each pair consists of a time-polarized EM wave coupled to a longitudinal EM wave, with coupling or "combining" accomplished by interaction (emission and absorption) with charge. This reinterpretation is strongly supported by Mandl and Shaw  in quantum field theory. Marco Bischof, Biophotons - The Light in Our Cells. 1995, German publisher: Zweitausendeins, Frankfurt. Low frequency (<300 Hz) electromagnetic (EM) fields induce biological changes that include effects ranging from increased enzyme reaction rates to increased transcript levels for specific genes. The induction of stress gene HSP70 expression by exposure to EM fields provides insight into how EM fields interact with cells and tissues. Insights into the mechanism(s) are also provided by examination of the interaction of EM fields with moving charges and their influence on enzyme reaction rates in cell-free systems. Biological studies with in vitro model systems have focused, in general, on the nature of the signal transduction pathways involved in response to EM fields. It is likely, however, that EM fields also interact directly with electrons in DNA to stimulate biosynthesis. Identification of an EM field-sensitive DNA sequence in the heat shock 70 (HSP70) promoter, points to the application of EM fields in two biomedical applications: cytoprotection and gene therapy. EM field induction of the stress protein hsp70 may also provide a useful biomarker for establishing a science-based safety standard for the design of cell phones and their transmission towers. J. Cell. Physiol. 192: 16–22, 2002. 2002 Wiley-Liss, Inc.
R Carhart-Harris et al. 'Neural correlates of the psychedelic state as determined by fMRI studies with psilocybin.' Proceedings of the National Academy of Sciences, published online 23 January 2012. Hu, Huping and Wu, Maoxin (2010), ‘Consciousness-mediated Spin Theory: The Transcendental Ground of Quantum Reality', JCER 1:8, pp. 937-970. Hu, Huping and Wu, Maoxin (2010), ‘Experimental Support of Spin-mediated Consciousness Theory from Various Sources', JCER 1:8, pp. 907-936. Hu, Huping and Wu, Maoxin (2008), ‘Concerning spin as mind-pixel: How mind interacts with the brain through electric spin effects', NeuroQuantology 6:1, pp. 26-31. Hu, Huping and Wu, Maoxin (2004), ‘Spin-mediated consciousness theory: possible roles of neural membrane nuclear spin ensembles and paramagnetic oxygen', Medical Hypotheses, 63, pp.633-646. Hu, Huping and Wu, Maoxin (2004), ‘Spin as primordial self-referential process driving quantum mechanics, spacetime dynamics and consciousness', NeuroQuantology 2:1, pp. 41-49. Jung, The Red Book (Liber Novus), W.W. Norton & Co.,October 7, 2009. Stephen Linsteadt, NHD, CNC The Heart of Health - The Principles of Physical Health and Vitality. F. A. Popp et al., "Biophoton emission: New evidence for coherence and DNA as a source," Cell. Biophys., Vol. 6, 1984, p. 33-52. FAIR USE NOTICE: This site may contain copyrighted material. Such material is made available for educational purposes only. This constitutes a 'fair use' of any such copyrighted material as provided for in Title 17 U.S.C. section 107 of the US Copyright Law.